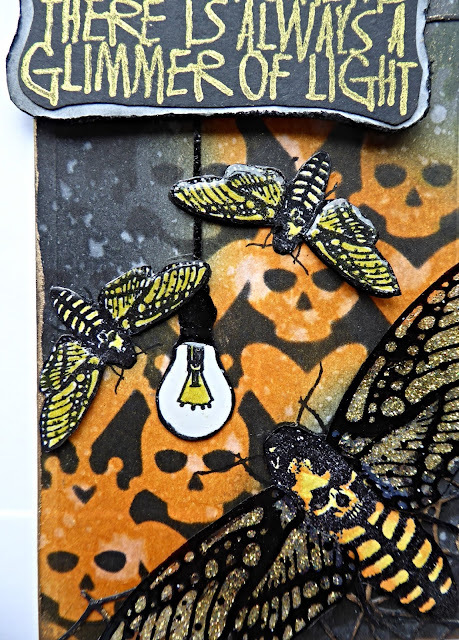 I used two embossing folders one panel folder by Tim Holtz and the other from Crafters Companion. 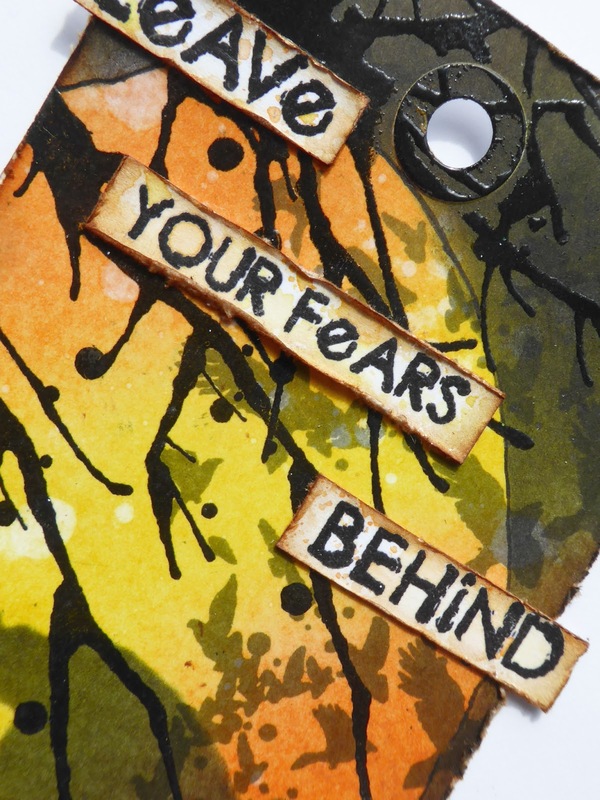 I also used matt silver card stock and silver metallic ink from Crafters Companion. 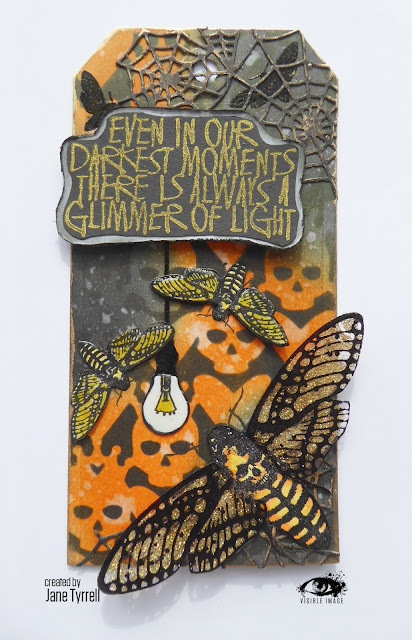 The acrylic paints are from Golden and the silver gilding wax from pebeo. The grey board cogs are from Imagination Crafts. 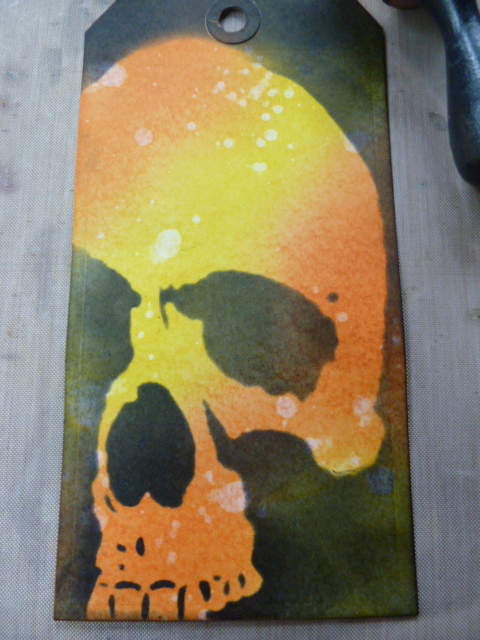 I began by creating a distress oxide background using metal patina colours.. 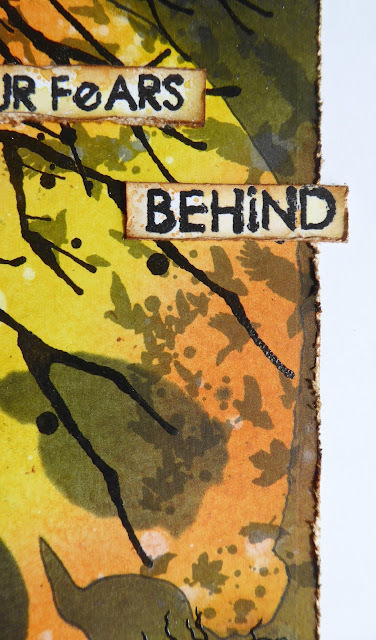 I added some paint to the path on top of the yellow alcohol ink so it was less bright. 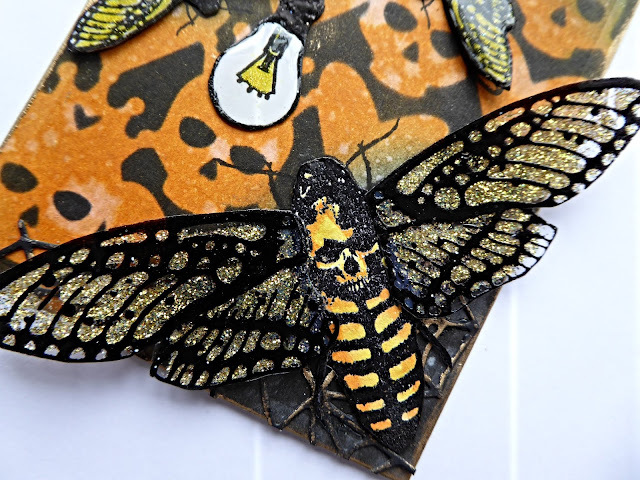 I have a new video to share with you today and no surprise that I have used the new butterfly stamps in my project..
That word metamorphosis… I’ll have that on multiple projects, and it’s perfect for the butterflies isn’t it. 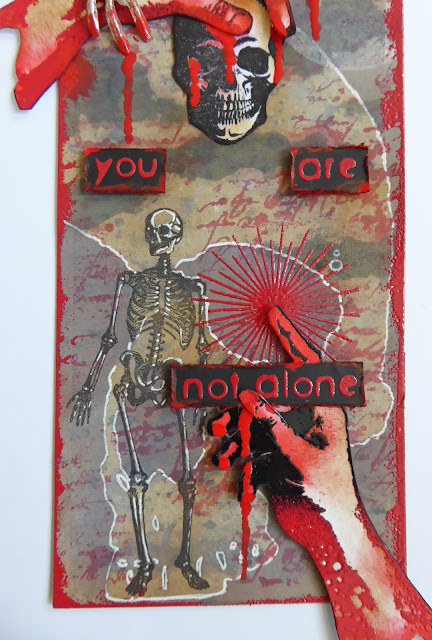 Another stunning tag and brilliant video Veerle.. 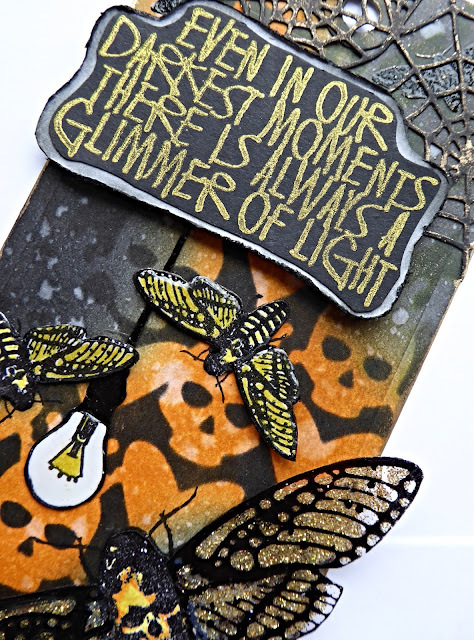 Thank you ♡ We love the touches of watercolour across the sentiment and butterfly, and your background is awesome! We’ll be back soon with some brilliant inspiration from Pauline! Have you subscribed to our NEW YouTube channel yet? Another inspiring video is on it’s way from Mark soon! We’ll be back later with more gorgeous inspiration. Good Evening, it’s Halloween, when ghouls and ghosts are the order of the day. Since the birth of my grandchildren I have thoroughly embraced Halloween fun. I also enjoy making special tags and then giving them on treat bags to my big and small babies. with a few close ups..
For my big children (average age 30 (!)) I make up their treat bags with Halloween chocolate but also some other non sweet goodies, as my son is not really a sweet eater. 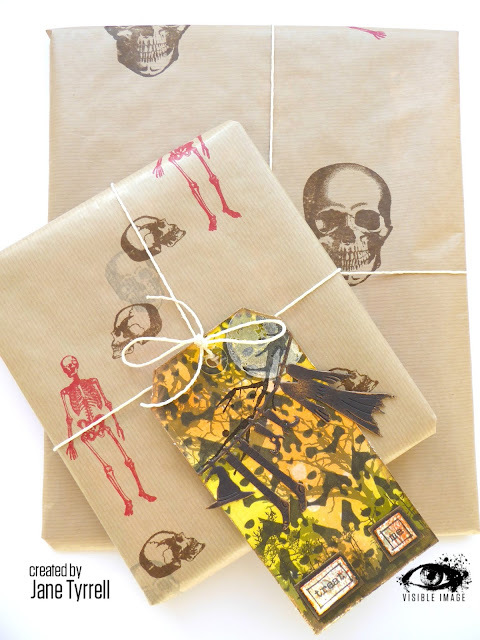 I also made them Halloween gift wrap.. I often make my own gift wrap for family presents. It makes a gift very personal. 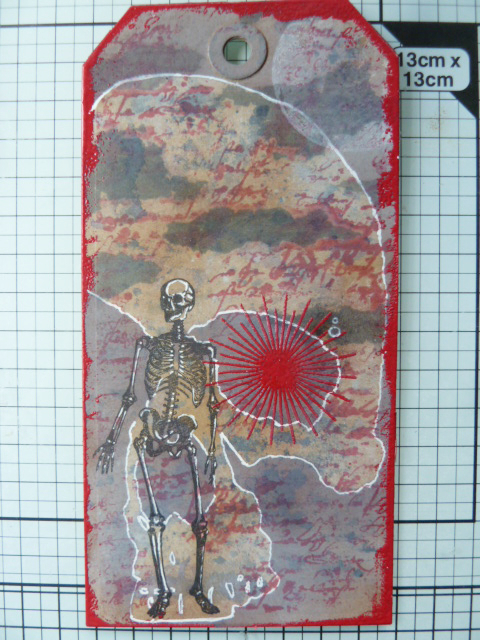 I used Mr Bone Jangles again to stamp onto brown paper. and yes you will spot another tag above…. 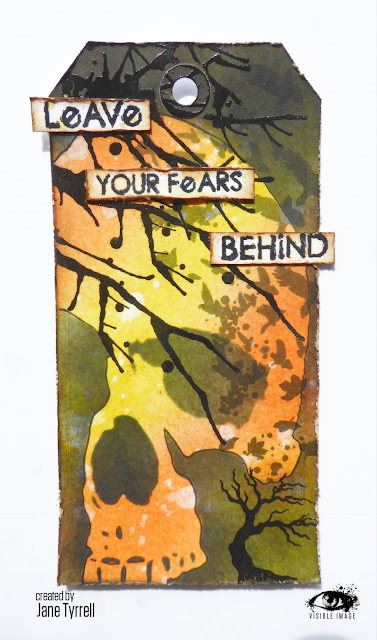 this one is Daisy’s using the Dark Hearts stencil , Into the Woods stamps and part of the sentiment from the Queen of Hearts set. 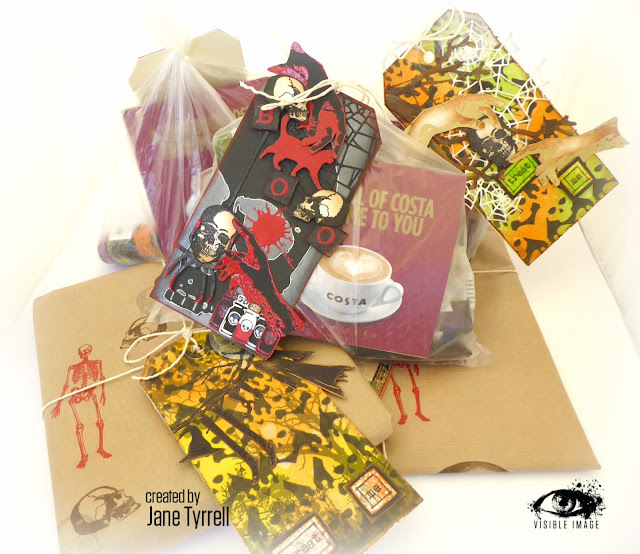 Below are a few of them all ready to be opened today… made with lots of spooky love! Thanks so much for stopping by today and remember to look out for the witches on their brooms tonight….whoooooohooo! Subscribe to our NEW YouTube channel to see lots of inspiring videos.. the first two are ready to view now! 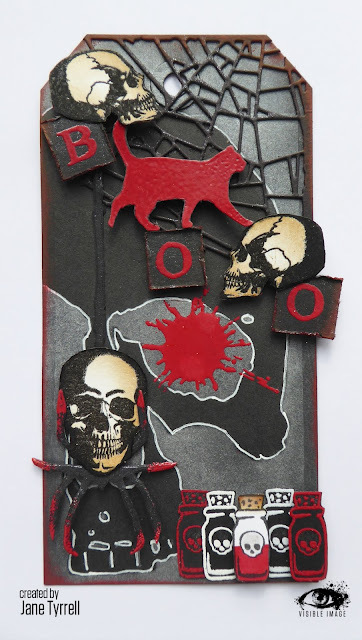 We will be back later this evening with more Halloween crafting from Pauline! 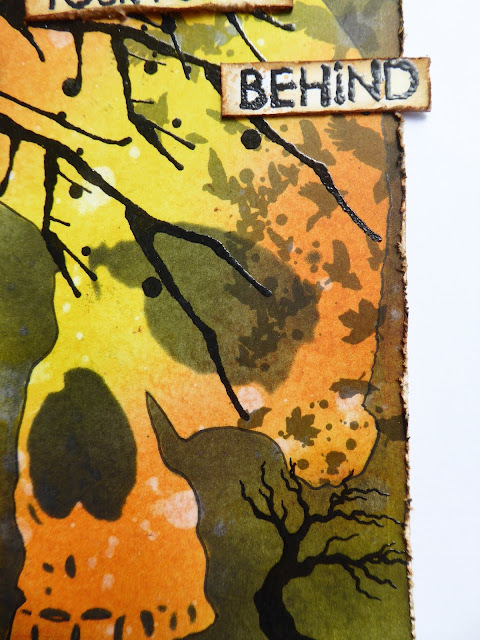 We are well into our monthly challenge over in our Facebook group, where the theme is Autumn colours. You can join in the fun here! 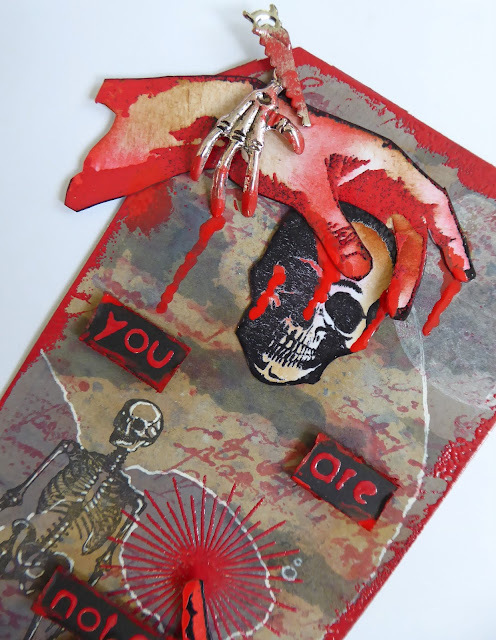 I am sharing my penultimate Visible Image Halloween tag today. 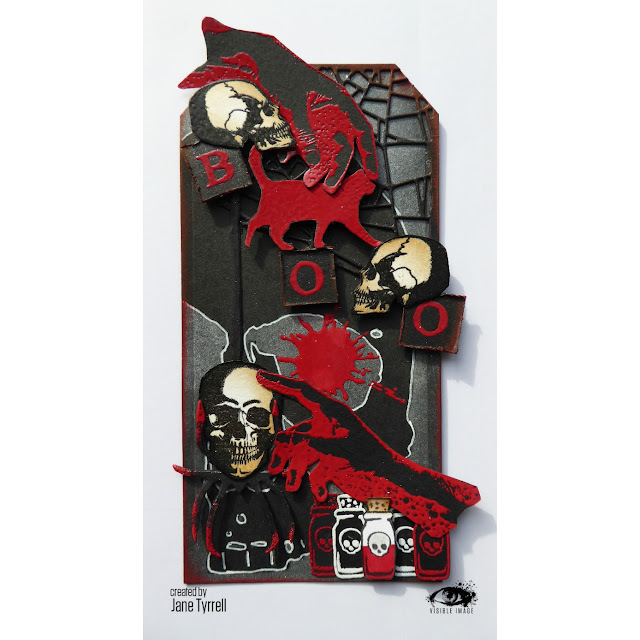 Now those who know me well know that I am not a particularly “skull” devotee in my crafting but at Halloween even I love the fun of this imagery. which I cut up and distressed. Remember to add your “Autumn colours” Visible Image creations over in our Facebook group, it will be great to see them. Enjoy the October sunshine and the glorious colours that are surrounding us. Thanks for stopping by today, and for the kind comments you take the time to leave me. 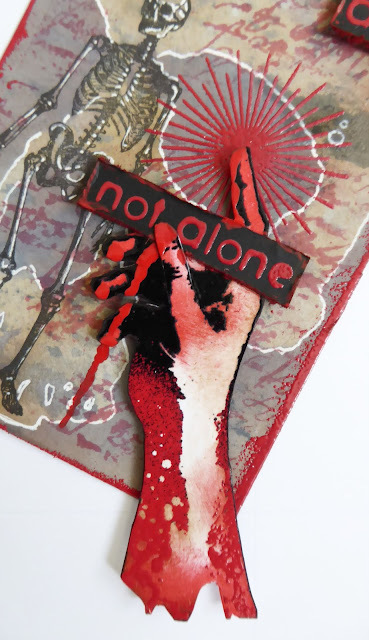 You will find more of Jane’s inspiring projects over on her blog. Subscribe to our NEW YouTube channel to see lots of inspiring videos.. the first one is ready to view now! We will be back later today with more inspiration! Love… with all of your heart. Love… unconditionally. Because before you know it, your chance of being able to give your love can be over and all you can do is look at the stars. Never thought that this video, which I made a couple of weeks ago, would make so much sense today. The feeling I had weeks ago, having me make this one, stands so much stronger after the past week. Lots of love, from me to you. 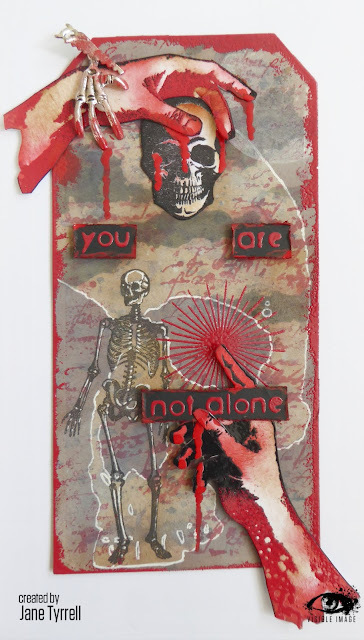 You… no one else. It’s you who is truly in charge of making your own story. Yes, you can leave it up to others but… will they write it the way you want it to go? After all, they can’t look inside of your head and soul to see what is really going on in there. And yes, others can come in and try to turn it all upside down. But you are in charge of taking control again and turn everything right back as you want it to be. Are there things we can’t control? Yes, sure. But you decide how to go from there. You see… you make your story. Make your story a beautiful one. We will be back tomorrow with lots more gorgeous inspiration!